A nuclear power station ( Grafenrheinfeld Nuclear Power Plant, Grafenrheinfeld, Bavaria, Germany). The nuclear reactor is contained inside the spherical containment building in the center – left and right are cooling towers which are common cooling devices used in all thermal power stations, and likewise, emit water vapor from the non- radioactive steam turbine section of the power plant. 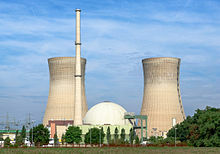 A nuclear power plant or nuclear power station is a thermal power station in which the heat source is a nuclear reactor. As it is typical of thermal power stations, heat is used to generate steam that drives a steam turbine connected to a generator that produces electricity. As of 23 April 2014[update], the International Atomic Energy Agency (IAEA) reports there are 450 nuclear power reactors in operation in 31 countries. 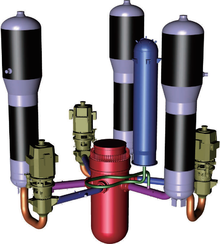 This page is based on the Wikipedia article Nuclear power plant; it is used under the Creative Commons Attribution-ShareAlike 3.0 Unported License (CC-BY-SA). You may redistribute it, verbatim or modified, providing that you comply with the terms of the CC-BY-SA.